When Neil Gaiman pays you a compliment about one of your typeface families (JY Integrity, which I designed in 1993), you gratefully accept. They are glorious. Thank you so much for making the font. Star Wars is in my feed in a big way. To get up to speed on the film series, I had to start with the memorable theme by John Williams. And who better to describe the plot than someone else in the science-fiction world, Doctor Who? Seriously though, I hope all friends who are big Star Wars fans enjoy Episode VII. It seems to be getting positive reviews, partly because it appeals to our sense of nostalgia. It hasn’t blown anyone away in the same manner as the 1977 original, but then Disney would be very foolhardy to stray for this sequel. If you are building a brand that was at its height 30 years ago, nostalgia isn’t a bad tool—just ask the team that came up with the 1994 Ford Mustang. J. J. Abrams—the creator of Felicity and What about Brian?, plus some other things—has apparently been a genius at getting just enough from the past. One item that is from Star Wars’ past is the opening title, or the crawl. I’ll be interested to learn if they’ve managed to re-create the typography of the original: they were unable to provide perfect matches for Episodes I through III because of the changes in technology and cuts of the typefaces that made it into the digital era. The main News Gothic type is far heavier in these later films. ITC Franklin Gothic was used for ‘A long time ago …’ for I to III; this, too, was originally News Gothic, but re-releases have brought all six films into line to use the later graphic. However, it could be argued that even between Episodes V and VI there were changes: News Gothic Extra Condensed in caps for the subtitle for The Empire Strikes Back, switching to Univers for Return of the Jedi. (It seems even the most highly ranked fan wiki missed this.) And, of course, there was no equivalent in the original Star Wars—’A New Hope’ was added in 1981. I wasn’t a huge fan in the 1970s: sci-fi was not my thing, and I only saw Star Wars for the first time in the 1980s on video cassette, but I did have a maths set, complete with Artoo Detoo eraser (I learned my multiplication table from a Star Wars-themed sheet) and the Return of the Jedi book of the film. But even for this casual viewer and appreciator, enough of that opening sunk in for me to know that things weren’t quite right for The Phantom Menace in 1999. I hope, for those typographically observant fans, that The Force Awakens gets things back on track. A ﬁnal postscript on my IE9 blank-window bug, again solved, as so many technological matters are here, by not following the advice of a self-proclaimed “expert”. Hayton at the McAfee forums—which seem to be populated with polite people—mentioned the Microsoft Baseline Security Analyzer earlier today. This checks for what updates are missing, etc. As I was told that my missing Windows 7 updates were a direct cause of my ‘injudicious’ use of System Restore by the man from Microsoft—who then proceeded to say that the only way to ﬁx my blank-window issue was to format my hard drive—I wanted to conﬁrm that he was wrong about everything. You see, he was wrong about the cause of the bug. He missed the basic fact that before my System Restore, IE9 was already not working. And I suspected he was wrong about the updates, since they should have occurred before the System Restore. This is what you get with some of these experts: they’re never right. And lo and behold, what did I discover? Just as I expected: Microsoft Baseline Security Analyzer reported that all my updates were up to date and I wasn’t missing a thing. Lesson: believe polite people. Disbelieve snarky people. Especially if they tell you to format your hard drive. Speaking of experts, Conrad Johnston found gold today for our Font Police site. In Whitby, there are some Experts in property—that’s right, with a capital E. If you’ve been to our Font Police site before, you’ve never seen anything this bad yet. One façade, countless offences—it’s the funniest one we’ve ever had. Finally, here’s a Microsoft Internet Explorer 9 thread that’s even weirder, as one user ﬁnds that the browser is incompatible with Helvetica and Neue Helvetica. Mine works with these families, but it looks like the only way William La Martin got his IE9 going was to delete them. Based on recent experience, the IE developers at Microsoft really have a problem with handling fonts. [Cross-posted from Tumblr] Found via Chris Brogan: if you Google Helvetica, Google will deliver the results in your default typeface—in my case, Alia. (If you look at the Snap Shots thumbnails that pop up, they’re in Times.) It’s weird, because I thought a fun trick would be to deliver the results in Helvetica (which is, of course, installed on our computers). The other queries display in our usual sans serif default (Lucire). Strange, but kind of fun. It’s the sort of thing that passes for humour inside Google, I believe. This and one of the folks inside the place having principles and getting rid of Google Places for being a content mill. It has been interesting reading the comments from other disgruntled Firefox users over the ‘unmark purple’ error (nsXULControllers::cycleCollection::UnmarkPurple(nsISupports*))—now that I can trace the majority of my crashes to this. Yesterday, Mozilla’s Crash Reports’ site crashed (rather ﬁtting), and today, the CSS wouldn’t load, which allowed me to read what others wrote on the Crash Reporter dialogue box. Really got fed up with this. Why this is happening again and again? god .. whats wrong with mymozila .. ??? i CAN’T BELIEVE YOU’VE DONE THIS! Two crashes in two days. Nothing unusual at all. Flash, of course. After the update.. this is 3. crash.. // güncelleme sonrası 3. oldu çöküşü oldu. Well, looks like your 3·6·13 update didn’t solve the crashes. Plug-in container crashed at the same time. The positive Firefox news today is that we implemented our ﬁrst font-face, at the Lucire website. We’ve been experimenting with font embedding ever since Microsoft WEFT at the turn of the century, and the results were always variable. They are by no means consistent today, because I’ve noticed that it works in Firefox, IE8 (before it crashes, but, then, it is Microsoft; and without kerning) and Opera 11 Beta (also sans kerning). Despite the presence of SVG ﬁles and references to them in the stylesheet, and the assurance that it is now switched on by default, it does not work on Chrome. No surprises there, with Google’s ever-buggy, typographer-unfriendly browser, though I am willing to accept the possibility that we mucked up on the CSS spec. Another friend, Steven, was able to conﬁrm Chrome’s failure to switch fonts when it encountered a change in language. Thank you, gentlemen, and for those who called to help earlier, for giving me the beneﬁt of the doubt. After my endless complaints about Firefox crashing on Twitter (even with a fresh install, it still crashes multiple times daily—even on the machine where the hard drive was reformatted), I was pointed to Opera 10·63. In case you think your eyes are deceiving you, those are, indeed, bitmap fonts. Actual size. On our computers, where Arial is absent, Opera defaults to System. It ignores whatever you feed into the font preferences until you start tweaking the CSS under opera:conﬁg. This is ridiculous. Since we have FontSubstitutes fed in to the Windows registry to indicate how Arial should be substituted, and every other program we have understands this, it seems silly for Opera to stand alone—and to substitute to one of the least likely fonts as a new default. It’s meant to be set in Helvetica. It is—except for the quotation marks. However, I can’t dis Opera too much because Firefox 1 and 2 had this rather serious omission, something I complained about at the time. It was only Firefox 3 that someone decided that displaying punctuation in the same font as everything else might not be a bad idea. It also does something funny to any word with an ﬁ or ﬂ ligature: it changes the font for that word. Nothing else, just that one word. Weird? You’re telling me, especially as the typeface appears to be Garamond Light—something I only speciﬁed for the H1-tagged headlines as a default. Believe me, there are no H1 codes on the page. I guess with the smaller user base, there have been fewer bug reports ﬁled about these issues. I have ﬁled one on the default fonts, and will be doing another on the remainder. The good news is that Opera doesn’t seem to crash quite as often. It also seems more compatible with Flash: my father, who browses news sites a lot, says he has far fewer problems with video buffering, even on an older machine. 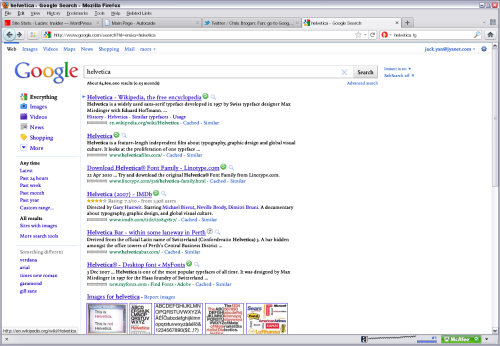 And I prefer the look of the browser—Google Chrome has really changed the æsthetics of how we expect browsers to look. So if you can live with the alleged weaker security and the poor typography, Opera seems to be a good browser. However, I can’t live with poor typography, so I might only use the browser as a back-up. Chrome: made by Google, and 2010 is my year of being Google-sceptic. I use Safari on the Mac, but we’ll leave that to another blog post.